While I had my Summertime papers out, I wanted to use them for my scrapbook, so I looked for pictures and found some of my mother when we went out for ice cream back in Quebec City, as this awesome chocolate factorry where they dip the ice cream in chocolate. The papers and chipboard were perfect for this page. This one is also inspired by the Paper Players challenge #309 - Something Sweet and Simon Says Stamp Monday Challenge - Summer Fun. A little while ago, I downloaded a serie of fun fonts and I used one of them for my journaling: Banana Yeti. It had that perfect ice cream place vibe to it. You can dowload it for free on DaFont, if you're interested. A few summers ago, we had a family gathering that included some of the cousins we don't get to see often. We took a family pic while we were all together. I finally added this pic to my album when I received the new Project Life by Stampin' Up! card collections. The one I used here is All Year Long. I kept the embellishments to a minimum, but you'll notice top right a border die-cut using the new Flourish Thinlits dies. Middle row, at left, I stamped "Let the party begin" with a now-retired Project Life stamp set. The bottom left card was stamped with a saying from the Fresh Fruit stamp set (Annual Catalogue, p. 149) and I added the circle scribble from the Swirly Scribbles Thinlits dies (AC, p. 194). I made sure to use the cards that had the pine tree silhouette scenery because the picture was taken back home and the scenery looks exactly like that, back where I come from. So I have finally broken my Oh Happy Day Card Kit open today. I remember when I got the Watercolor Wishes kit last year that I meant to make only one card with it and had so much fun that I ended up putting together the whole kit in one sitting! 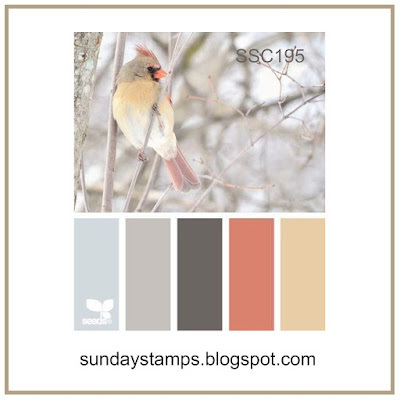 I had a feeling this might happen again with the new colorful card kit Stampin' Up! added to its annual catalogue this year, so I waited until today to crack it open, even though I've bought it on my first new catalogue order. I absolutely love the new Oh Happy Day kit just as much as I loved the Watercolor Wishes one. I was torn between making the suggested cards and using the kit contents to make up new stuff with. I finally ended up doing both: making the full-size cards as suggested and using the smaller cards to design my own projects. As I was about to make the regular-size card with the flower background, I thought i was such a beautiful design (the background florals and the flower die-cut) that I decided I wanted to keep those to myself. And from this thought was born the idea to make a Project Life page using the kit elements. I'm quite pleased with how it turned out. I even managed to include the kit's stamp set by stamping "I Love You" on a heart I die-cut with the Sweet & Sassy Framelits dies. I used the back of one of the smallest cards to die-cut the heart, and the big heart on the front of the trifold card was used on my title insert (top right). The only element that did not come from my Stampin' Up! supplies is the gold leafing that I did around the heart at top. The kit includes a lot of gold elements and I decided to give golf leafing a try using our Heat 'n Stick Powder. I need practice with this technique, but it was a nice way to add a bit of interest to my page. The title was stamped with the new Brushstrokes Alphabet (a nice size for Project Life inserts) and the date was added with the Date It Project Life stamp set. The font is so nice, it almost looks like it was part of the die-cut instead of something I stamped myself! This stamp set is very versatile: not only does in include the months in two different sets of font, it also has the season. And the numbers go up to 31, so you don't have to line up the numbers individually to create your dates. It saves time, but it also makes lining up way easier. In this instance, to stamp 2012, I only had to use 20 and 12 and line them together, so getting the spacing right was way easier than when I use four stamps. Since I had the last Project Life date set, I was hesitant to get this one, but seeing how beautiful the font is on this page, I'm glad I did. I had some Jillibean Soup art-themed papers that inspired to look through my pictures to see if I had any of me crafting. I found those old pictures taken over a decade ago when I first discovered scrapbooking. Back then I was sharing an apartment with my sister so I had to lug everything to the kitchen table when I wanted to craft, create up a storm and then put everything away again. My sister was incredibly patient with me, as she's had to eat in the living room a few times because not only was the whole kitchen table covered with my stuff, but I had also put some stuff on chairs as well for lack of room! Seeing that mishmash of stuff in the pictures makes me really grateful I now have a spot reserved to my crafting and better crafting supplies! I've come miles - wish you could get a close-up of that card that was displayed on the table in front of me. You'd get a good laugh! Some of the Jillibean papers had 3" x 4" die-cut cards that I cut apart and used, but I embellished them a bit - I added Candy Dots on the pushpins and a yellow-embossed wooden heart on the pin cushion. The sentiment card was stamped with stitching and embossed with Melon Mambo powder, then I added stamped sequins. Those image come from the Love You Sew hostess stamp set. I used the used the same set to create my own card at left. I started with the grid Project Life cards Stampin' Up! was carrying and I embossed the paint brushstroke image in seven colors: Merlon Mambo, Cherry Cobbler, Tango Tangerine, Crushed Curry, Gumball Green, Pool Part and Navy. Then I inked the little brush with Stampin' Write markers in matching colours and handcut them, then glued them to the card using Dimensionals. That whole process was a little time-consuming, but I love the result. I added the date using the Collage Numbers stamp set (long retired) and Jet Black StazOn ink. I have family In British Columbia that I keep in touch via cards and emails, but I don't get to visit them all that often. The last time I saw my cousin Monique and my aunt Raymonde, it was fifteen years ago when they visited us in Quebec City. When I learned that I would be attending a meeting held in Victoria, I was really excited at the chance to get together with my cousins and catch up! Louise drove to Nanaimo to join us. It was a great day! We took a picture on Louise's tablet as a little memento of our day together. Hopefully, I'll see them again before another 15 years' time, this time around. It's a little strange to be making a page with snowflakes and cold elements when summer has finally arrived and it's warm and sunny outside, but that's usually how it goes with paper crafts. You prepare cards ahead of the season and you scrapbook your pictures after the fact. This page came together really quickly thanks to the Snow Patrol Simple Stories set, that includes papers and matching stickers. The picture was taken at the sugar shack during the Easter weekend, when my parents were visiting from out of town. I was trying to take a family picture of everyone and my niece Megan simply refused to go with the rest of the family to get her picture taken. Knowing how she usually operates, I asked if she would join us if I was in the picture as well and sure enough, she complied. That of course implied that the picture then became a selfie. I'm not really great at selfie picture yet and my face is only hald half in it, but it doesn't matter because it captures the memory of the beautiful sunny day being all together. And Megan's grimace, which is recurring on many pictures. We have a 50/50 chance of getting an ear-to-ear grin or a grimace. We got the latter that day. I had put aside a few picture options when trying to decide on which pictures to scrapbook for the Global Design Project Challenge #35 and once I was done with the first page, I was inspired to keep going with a second one. This time, I switched to the Project Life by Stampin' Up! cards from the Hello December 2015 collection. Those have been my absolute favorite for two years in a row, so it seems like Stampin' Up! is really hitting it out of the ballpark with this theme. I used both the cards and the matching accessories, and added a few extra items here and there to decorate the cards, including an hostess stamp set that has been retired for years. I wonder if some of you who have been stamping for a while will remember Holiday Blocks? 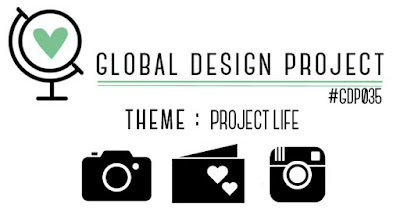 This week's Global Design Project challenge #35 is Project Life by Stampin' Up! This is right up my alley, so I was hoping to have time to take part in the challenge. I went through my pictures tonight and selected some Christmas ones from two years ago and paired them with the Seasonal Snapshots cards. A lot of the cards included in the kits are journaling cards, so I like to punch out or handcut the design elements from them and add them to other cards or to my pictures, which is what I did here to create borders and fill out the empty spaces. The title reads, "Our best gift is you." My niece Megan is the first baby on our side of the family and as I say in the journaling, we are always fussing over her and she's showered with gifts and love. I just can't imagine not having her around anymore. I wanted to use the new You Are Here! suite from Simple Stories, so I looked through my pictures to find some traveling ones and found some that were taken in Nashville a few years ago when Stampin' Up! held its Leadership convention there. The event was hosted at the Opryland Gaylord convention centre, which was the most impressive place we've ever been to. This centre is huge! It includes a convention center, an hotel, restaurants and shops, trees, water fountains, even a boat ride!! It reminded me of the West Edmonton Mall. I took so many pictures of the place that I wanted to include in my album that this turned into a four-page layout. I wanted to use some new papers and die-cuts from My Mind's Eye I got and I found this old portrait of myself, where my jacket matches the pink in the papers perfectly. I cut my own pocket inserts out of the papers. One page has die-cuts already on it, so that's where I got the heart, already ready to go in a square pocket. The papers have gold foil on them, so they are beautiful in person. These pictures were taken last year when we brought my niece to see Disney on Ice. I paired them with the Cheese II papers from Simple Stories, which are designed around the Disney World theme, so they were perfect for this. My sister sent me pictures of my niece learning to ice skate, so I paired them with some Bo Bunny papers to make this pocket protector page. I used the Fuse Tool to turn one of the pocket into a shaker, by putting sequins, wooden snowflakes and glitter inside before fusing shut. Learn from my mistake - put a very SMALL amount of glitter instead. I thought I would need quite a bit to see the result, but that is not the case, and the glitter tends to static cling to the sides of the pocket, so less is definitely more here!!! When my brother-in-law turned 30, my sister gave him a waist bag as a joke, saying that he was now old and that he would soon be starting to dress like an old man. He was quick to bring back the bag when it was her thirtieth birthday. The kids starting trying on the bag, and my niece was just hilarious with the bag on over her pink-heart pj's, drinking milk out of a sippy cup... Seems like everything is cuter on a 1½ year old! I used the Number of Years stamp set and matching Big Numbers Framelits to cut out my 30 out of red paper. When I bought my condo, my dad had to borrow my brother-in-law's power tools a few times to set things up around the place, so for Christmas, he thought the new homeowner might benefit from having her own drill. My mom reported that he totally took it upon himself to go shopping for what I needed (and my dad is really not big on shopping...) so I was pretty impressed - and grateful not to have to spend pocket change on power tools myself. Now, I can't say the drill has been used a whole lot since Christmas, but it'll be right there when I will need it. The cute inserts are from the Cozy Christmas collection by Simple Stories. For the sugar-coated letters, I applied a piece of adhesive sheets on the back AND the front of the cardstock BEFORE die-cutting the letters. The back part transformed the letters into stickers and helped glue them to the page quickly. And by adding the adhesive sheets to the front, I was able to cover the whole letter with Dazzling Diamonds glitter quickly and evenly. My sister and I went to the museum with Megan on the Sunday when all museum access was free in Montreal. My sister's spouse drove us there, but we came back to Laval on the subway, and it was the first time Megan rode it. The bottom picture is funny because we were trying to have Megan show one finger up to indicate her first trip on the subway, but I think she got confused with showing her age, being used to showing two fingers. It cracked everybody up, including the lady that was sitting on the bench with us, waiting for the subway! I made my own pocket inserts out of Authentique patterned papers, which matched the colours of the subway tiles in my picture nicely. It was Megan's first Easter where she was old enough to understand the egg hunt concept, so her mom went all out with the bunny ears, the mini egg trail and the bunny plush toy. Megan loved the reaction she was getting with the bunny ears, so she hammed it up and we got some pretty cute pictures out of it. I used the Project Life Dear Lizzie card set, and the soft pastel colours were perfect for Easter. My sister work in the Health and Safety field, so a friend gave her a gag gift for her 30th anniversary. Even wrapped it in caution tape! My sister's spouse hit it right on the head with her 30th birthday cake and got her favorite from our local cake place (which we hid at my place until the surprise party so she wouldn't suspect anything). I made my own sparkly alphabet letters by die-cutting red glimmer paper. Sshh... It Hurts My Ears! For a little while, Megan got in the habit of telling us "Sshh, it hurts my ears! ", even when we were not talking loudly. We weren't sure where she got that (it wasn't from home), so we figured it might be something she was hearing at day care and that the educators there used to teach the kids not to yell. When I saw this picture of her with her mom covering her ears, I thought it was the perfect picture to record that phase of hers (which, luckily, she seems to have already outgrown). The Project Life cards come from last year's Hello December card collection (2014), and selecting cards with no Holidays images on them worked well for a regular layout. Just a really simple page I made using some masculine papers (from Simple Stories) that were perfect for my baby boy pictures. The only fancy detail on this page is that I used the star stencil from Stampin' Up! (annual catalogue, p. 157) and applied silver paste to create dimensional stars on my top insert. I usually try to having buying big 12" x 12" paper stacks because you never have enough of a lifetime of crafting to go through them. I broke my own rule with this paper pack called Seaglass, though, because I kept eyeing the patterns and decided I love every single page in the stack. The soft colours and textured paper were also really appealing, so I caved. Aside from using them on cards, I knew I wanted to use them paired with pictures from my trip to Seattle, when we took a road trip to Oregon and stopped in Seaside on the way. It was a beautiful warm sunny day in September and the pictures (taken with my iPhone) came out just lovely. I cut out my own inserts using the Project Life Cards & Labels Framelits. Those were a great investment. I initially bought them more for the little labels, thinking I wouldn't use the card dies very much since I can just cut the cardstock to size and round the corners with the Project Life punch, but I found that they are very useful when I want to center a design, text or picture. I can just frame whatever I want to have on my insert using the die and then I'm sure the image appears exactly where I want it on the card. This was the case here for the cards in the middle row. The paper stack had a couple of pages of images that were meant to be cut out to make tags or accents, but most of them weren't sized to go with pocket scrapbooking, so I cut them to the size I needed for my page. I like how the alphabet stickers from American Crafts I used on the lower left insert look like they are covered with sand! Perfect for this page!